Check out this recent interview of Jack Hartung, Chief Financial Officer of Chipotle. Subject: Chipotle opens in London! Subject: Get a Free Burrito! Subject: Chipotle tests new vegan Garden Blend option! Give up your burrito this week, and please donate $10 to the Doctors Without Borders Haiti Relief Fund. We have just posted a copycat recipe of the Chipotle Corn Salsa. Try it out, and comment on whether or not it is a contender! Subject: Chipotle Featured on South Park! We have finally found a promising clone recipe for the Chipotle Red Hot Salsa. Check out the recipe, take photos, then contact us to share your results! Subject: Chipotle is now healthier! Chipotle is now HEALTHIER! After tediously going through and updating every nutrition value, I noticed that almost across the board, each item has less sodium and less calories than before. This means that either Chipotle is nefariously decrementing nutrition values to improve its image, or that they are actually working on making their recipes healthier. I think it's safe to say that they are working hard in the Chipotle test kitchen to make your burritos, bols, tacos, and salads healthier. Go ahead and calculate your meal now! We have posted the delicious Chipotle Honey Vinaigrette Dressing recipe. Enjoy. Subject: On Friday buy a burrito . . . get a t-shirt . . . at Century III Chipotle's Grand Opening!! Step right up . . . buy a burrito after 3:00pm, get yourself a free Chipotle t-shirt, and a coupon good for a free burrito on your next visit. Register to win FREE BURRITOS FOR A YEAR!! Grand opening celebration starts at 11:00pm, Friday, January 23rd, 2009, at the new Century III Chipotle near Pittsburgh!! Help show your support, and become a fan of ChipotleFan on Facebook. Check out a recent article by Thomas Heath on Matt and how he created ChipotleFan and how he started his new viral video venture. Subject: First Tomatoes, Now Jalapenos. What next . . . Cilantro? Subject: ChipotleFan.com on the News! Subject: Why do you love Chipotle? In 2008, Chipotle has committed to serving over 50,000,000 pounds of naturally raised meat in its stores across the country, which will be a 40% increase from 2007. Chipotle continues to set the bar for ethics in the food industry, and while some prominent businesses are divesting from organic and natural food, Chipotle is only increasing the natural offerings at their restaurants. Subject: Brown Rice at Chipotle? Chipotle appears to have started another video contest. View our video page to see the current entries. Come to Chipotle this Wednesday, October 31st, dressed like a burrito, bol, salad, or tacos, and get a FREE BURRITO! See the official announcement. Subject: Win a year-supply of burritos! Chipotle's stock has risen some 16% based on better than expected results from their 2007 1st quarter earnings report. For more information on Chipotle's stock, please visit our Chipotle Stock page. Subject: Is Chipotle owned by McDonald's? ChipotleFan.com was recently featured in The George Washington University's independent newspaper, the GW Hatchet. Check out the article! Chipotle has just announced its first ever Video-Ad contest for colleges accross the nation! View our video contest page for more details. Come to Chipotle dressed as a burrito, taco, bol, or salad on Halloween (October 31st, 2006) between 5pm and 10pm, and get a FREE BURRITO. See the official announcement, or discuss costume options on our message board. Subject: Buy One Share of Chipotle Stock! Added the nutrition information for the Chipotle Honey Vinaigrette dressing to the nutrition calculator. It has a surprising amount of sodium, but the values are all correct, directly from the chipotle nutrition PDF (hosted by chipotle.com). Dress up in foil on Halloween (October 31st), and get a FREE boorrito! See Chipotle's official announcement. I am planning on adding a new pictures section to the site, but I need your help! Please send me pictures of you at Chipotle, or eating Chipotle food. Creativity is key in the pictures, as only interesting ones will make it onto the site. If there is a story behind the picture, send that too. Bonus points go to those who somehow incorporate ChipotleFan into their pictures. Submitting a picture will automatically enter you into the contest. The prize is yet to be determined, but I need to start collecting pictures ASAP. To enter send a picture and any necessary info about it to [email protected]. Thanks, and good luck! 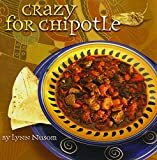 I recently came accross these interesting books on Chipotle Chiles. They are very inexpensive and a must for any true Chipotle Fan. Buy a Chipotle Gift Card between Jan. 31st and Feb. 11th. Bring the receipt back anytime between February 12th to 14th and exchange it for a FREE burrito.